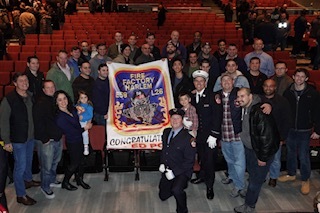 Noroton Fire Department would like to congratulate Ed Poli on his promotion to Captain in the FDNY. Ed is a 14 year veteran member of FDNY currently working out of The Fire Factory Engine 58 / Ladder 26 in Harlem, NY. Ed is also a long time member of NFD where Ed began his fire fighting career prior to joining the FDNY. Ed frequently returns to NFD to help run training evolutions and share the latest advancements in fire fighting techniques. NFD is very proud of Ed and all of his accomplishments. All the best Ed!! !